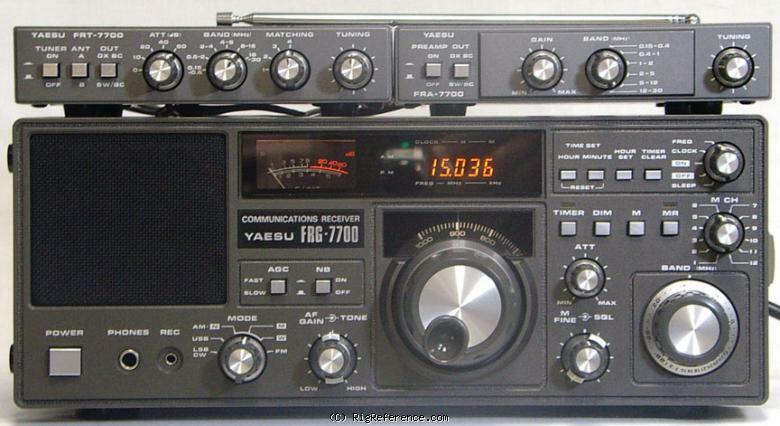 The FRG-7700 is not the best receiver to be had, but it performs quite okay for a rig more than 20 years old. I bought mine for about 75 euro's, which I think is great value. The optional memory module isn't installed in my rig. I also have the antenna tuner (FRT-7700), but I don't use it much. Frequency stability is the biggest weakness in my opinion. In order to listen to a station (especially weak ones) you need to constantly keep tuning. If you don't you'll lose the station in minutes. Receiving digital modes is all but impossible because of this instability. All in all the FRG-7700 is a basic rig which performs well considering its age. But its great fun to use and listen to! A really good, basic SWL set similar in design to the Kenwood R-1000. It almost requires a tuned antenna though, and in fact Yaesu made a complementary preselector-tuner for this radio. When used as such (just an indoor tuned loop is fine) the FRG-7700 really sings - you'll be in for an SWL joy ride. Good punchy audio, great stability, ease of use and fairly good filter selectivity on sideband (2.7 kHz). Its a desktop rig that doesn't do too much, but doesn't do too little, and delivers the goods in fine fashion. The FRG-7700 doesn't usually sell for a lot - it shouldn't - I'd say a perfect, unblemished version is worth $300, tops, not a penny more. exellent reciver,picks up signals very well one of the best hf recivers i have ever owned will never part with it. Estimating the value of a rig can be challenging. We collect prices paid by real hams over the years to help you estimate the current value of the Yaesu FRG-7700. Just bought or sold this model? Let us know what you traded it for and help other ham operators!